Panspermia (from Greek πᾶν (pan), meaning "all", and σπέρμα (sperma), meaning "seed") is the hypothesis that life exists throughout the Universe, distributed by meteoroids, asteroids, comets, planetoids, and also by spacecraft in the form of unintended contamination by microorganisms. Panspermia is a hypothesis proposing that microscopic life forms that can survive the effects of space, such as extremophiles, become trapped in debris that is ejected into space after collisions between planets and small Solar System bodies that harbor life. Some organisms may travel dormant for an extended amount of time before colliding randomly with other planets or intermingling with protoplanetary disks. If met with ideal conditions on a new planet's surfaces, the organisms become active and the process of evolution begins. Panspermia is not meant to address how life began, just the method that may cause its distribution in the Universe. Pseudo-panspermia (sometimes called "soft panspermia" or "molecular panspermia") argues that the pre-biotic organic building blocks of life originated in space and were incorporated in the solar nebula from which the planets condensed and were further—and continuously—distributed to planetary surfaces where life then emerged (abiogenesis). From the early 1970s it was becoming evident that interstellar dust consisted of a large component of organic molecules. Interstellar molecules are formed by chemical reactions within very sparse interstellar or circumstellar clouds of dust and gas. The dust plays a critical role of shielding the molecules from the ionizing effect of ultraviolet radiation emitted by stars. The chemistry leading to life may have begun shortly after the Big Bang, 13.8 billion years ago, during a habitable epoch when the Universe was only 10–17 million years old. Though life is confirmed only on the Earth, some think that extraterrestrial life is not only plausible, but probable or inevitable. Other planets and moons in the Solar System and other planetary systems are being examined for evidence of having once supported simple life, and projects such as SETI are trying to detect radio transmissions from possible alien civilizations. The first known mention of the term was in the writings of the 5th century BC Greek philosopher Anaxagoras. Panspermia began to assume a more scientific form through the proposals of Jöns Jacob Berzelius (1834), Hermann E. Richter (1865), Kelvin (1871), Hermann von Helmholtz (1879) and finally reaching the level of a detailed hypothesis through the efforts of the Swedish chemist Svante Arrhenius (1903). Several simulations in laboratories and in low Earth orbit suggest that ejection, entry and impact is survivable for some simple organisms. In 2015, "remains of biotic life" were found in 4.1 billion-year-old rocks in Western Australia, when the young Earth was about 400 million years old. According to one of the researchers, "If life arose relatively quickly on Earth … then it could be common in the universe." Panspermia can be said to be either interstellar (between star systems) or interplanetary (between planets in the same star system); its transport mechanisms may include comets, radiation pressure and lithopanspermia (microorganisms embedded in rocks). Interplanetary transfer of nonliving material is well documented, as evidenced by meteorites of Martian origin found on Earth. Space probes may also be a viable transport mechanism for interplanetary cross-pollination in the Solar System or even beyond. However, space agencies have implemented planetary protection procedures to reduce the risk of planetary contamination, although, as recently discovered, some microorganisms, such as Tersicoccus phoenicis, may be resistant to procedures used in spacecraft assembly clean room facilities. In 2012, mathematician Edward Belbruno and astronomers Amaya Moro-Martín and Renu Malhotra proposed that gravitational low energy transfer of rocks among the young planets of stars in their birth cluster is commonplace, and not rare in the general galactic stellar population. Deliberate directed panspermia from space to seed Earth or sent from Earth to seed other planetary systems have also been proposed. One twist to the hypothesis by engineer Thomas Dehel (2006), proposes that plasmoid magnetic fields ejected from the magnetosphere may move the few spores lifted from the Earth's atmosphere with sufficient speed to cross interstellar space to other systems before the spores can be destroyed. In 1903, Svante Arrhenius published in his article The Distribution of Life in Space, the hypothesis now called radiopanspermia, that microscopic forms of life can be propagated in space, driven by the radiation pressure from stars. Arrhenius argued that particles at a critical size below 1.5 μm would be propagated at high speed by radiation pressure of the Sun. However, because its effectiveness decreases with increasing size of the particle, this mechanism holds for very tiny particles only, such as single bacterial spores. The main criticism of radiopanspermia hypothesis came from Shklovskii and Sagan, who pointed out the proofs of the lethal action of space radiations (UV and X-rays) in the cosmos. Regardless of the evidence, Wallis and Wickramasinghe argued in 2004 that the transport of individual bacteria or clumps of bacteria, is overwhelmingly more important than lithopanspermia in terms of numbers of microbes transferred, even accounting for the death rate of unprotected bacteria in transit. 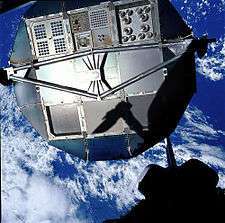 Then, data gathered by the orbital experiments ERA, BIOPAN, EXOSTACK and EXPOSE, determined that isolated spores, including those of B. subtilis, were killed by several orders of magnitude if exposed to the full space environment for a mere few seconds, but if shielded against solar UV, the spores were capable of surviving in space for up to 6 years while embedded in clay or meteorite powder (artificial meteorites). Though minimal protection is required to shelter a spore against UV radiation, exposure to solar UV and cosmic ionizing radiation of unprotected DNA, break it up into its bases. Also, exposing DNA to the ultrahigh vacuum of space alone is sufficient to cause DNA damage, so the transport of unprotected DNA or RNA during interplanetary flights powered solely by light pressure is extremely unlikely. The feasibility of other means of transport for the more massive shielded spores into the outer Solar System – for example, through gravitational capture by comets – is at this time unknown. Based on experimental data on radiation effects and DNA stability, it has been concluded that for such long travel times, boulder sized rocks which are greater than or equal to 1 meter in diameter are required to effectively shield resistant microorganisms, such as bacterial spores against galactic cosmic radiation. These results clearly negate the radiopanspermia hypothesis, which requires single spores accelerated by the radiation pressure of the Sun, requiring many years to travel between the planets, and support the likelihood of interplanetary transfer of microorganisms within asteroids or comets, the so-called lithopanspermia hypothesis. Planetary ejection — For lithopanspermia to occur, Cockell conjectured that microorganisms must survive ejection from a planetary surface which involves extreme forces of acceleration and shock with associated temperature excursions. Hypothetical values of shock pressures experienced by ejected rocks are obtained with Martian meteorites, which suggest the shock pressures of approximately 5 to 55 GPa, acceleration of 3 Mm/s2 and jerk of 6 Gm/s3 and post-shock temperature increases of about 1 K to 1000 K. To determine the effect of acceleration during ejection on microorganisms, rifle and ultracentrifuge methods were successfully used under simulated outer space conditions. For example, microbial payloads launched by solar sails at speeds up to 0.0001 c (30,000 m/s) would reach targets at 10 to 100 light-years in 0.1 million to 1 million years. Fleets of microbial capsules can be aimed at clusters of new stars in star-forming clouds, where they may land on planets or captured by asteroids and comets and later delivered to planets. Payloads may contain extremophiles for diverse environments and cyanobacteria similar to early microorganisms. Hardy multicellular organisms (rotifer cysts) may be included to induce higher evolution. The probability of hitting the target zone can be calculated from where A(target) is the cross-section of the target area, dy is the positional uncertainty at arrival; a – constant (depending on units), r(target) is the radius of the target area; v the velocity of the probe; (tp) the targeting precision (arcsec/yr); and d the distance to the target, guided by high-resolution astrometry of 1×10−5 arcsec/yr (all units in SIU). These calculations show that relatively near target stars(Alpha PsA, Beta Pictoris) can be seeded by milligrams of launched microbes; while seeding the Rho Ophiochus star-forming cloud requires hundreds of kilograms of dispersed capsules. A number of publications since 1979 have proposed the idea that directed panspermia could be demonstrated to be the origin of all life on Earth if a distinctive 'signature' message were found, deliberately implanted into either the genome or the genetic code of the first microorganisms by our hypothetical progenitor. In 2013 a team of physicists claimed that they had found mathematical and semiotic patterns in the genetic code which, they believe, is evidence for such a signature. A microscopic ball made of titanium and vanadium was found in Earth's upper atmosphere in early 2015. Milton Wainwright, a UK researcher and astrobiologist at the University of Buckingham claimed in a tabloid that the metal ball "could contain DNA." He speculates that it could be an alien device sent to Earth by extraterrestrials in order to continue seeding the planet with life. It is estimated that space travel over cosmic distances would take an incredibly long time to an outside observer, and with vast amounts of energy required. However, there are reasons to hypothesize that faster-than-light interstellar space travel might be feasible. This has been explored by NASA scientists since at least 1995. An Indian and British team of researchers led by Chandra Wickramasinghe reported on 2001 that air samples over Hyderabad, India, gathered from the stratosphere by the Indian Space Research Organisation (ISRO), contained clumps of living cells. Wickramasinghe calls this "unambiguous evidence for the presence of clumps of living cells in air samples from as high as 41 km, above which no air from lower down would normally be transported". Two bacterial and one fungal species were later independently isolated from these filters which were identified as Bacillus simplex, Staphylococcus pasteuri and Engyodontium album respectively. Similar isolation experiments at separate laboratories were unsuccessful. Pushkar Ganesh Vaidya from the Indian Astrobiology Research Centre reported in 2009 that "the three microorganisms captured during the balloon experiment do not exhibit any distinct adaptations expected to be seen in microorganisms occupying a cometary niche". In 2005 an improved experiment was conducted by ISRO. On April 10, 2005, air samples were collected from the upper atmosphere at altitudes ranging from 20 km to more than 40 km. The samples were tested at two labs in India. The labs found 12 bacterial and 6 different fungal species in these samples. The fungi were Penicillium decumbens, Cladosporium cladosporioides, Alternaria sp. and Tilletiopsis albescens. Out of the 12 bacterial samples, three were identified as new species and named Janibacter hoylei (after Fred Hoyle), Bacillus isronensis (named after ISRO) and Bacillus aryabhattai (named after the ancient Indian mathematician, Aryabhata). These three new species showed that they were more resistant to UV radiation than similar bacteria. Atmospheric sampling by NASA in 2010 before and after hurricanes, collected 314 different types of bacteria; the study suggests that large-scale convection during tropical storms and hurricanes can then carry this material from the surface higher up into the atmosphere. On January 10, 2013, Chandra Wickramasinghe found fossil diatom frustules in what he thinks is a new kind of carbonaceous meteorite called Polonnaruwa that landed in the North Central Province of Sri Lanka on 29 December 2012. Early on, there was criticism that Wickramasinghe's report was not an examination of an actual meteorite but of some terrestrial rock passed off as a meteorite. Wickramasinghe's team remark that they are aware that a large number of unrelated stones have been submitted for analysis, and have no knowledge regarding the nature, source or origin of the stones their critics have examined, so Wickramasinghe clarifies that he is using the stones submitted by the Medical Research Institute in Sri Lanka. In response to the criticism from other scientists, Wickramasinghe performed X-ray diffraction and isotope analyses to verify its meteoritic origin. His analysis revealed a 95% silica and 3% quartz content, and interpreted this result as a "carbonaceous meteorite of unknown type". In addition, Wickramasinghe's team remarked that the temperature at which sand must be heated by lightning to melt and form a fulgurite (1770 °C) would have vaporized and burned all carbon-rich organisms and melted and thus destroyed the delicately marked silica frustules of the diatoms, and that the oxygen isotope data confirms its meteoric origin. Wickramasinghe's team also argues that since living diatoms require nitrogen fixation to synthetize amino acids, proteins, DNA, RNA and other life-critical biomolecules, a population of extraterrestrial cyanobacteria must have been a required component of the comet (Polonnaruwa meteorite) "ecosystem". Until the 1970s, life was believed to depend on its access to sunlight. Even life in the ocean depths, where sunlight cannot reach, was believed to obtain its nourishment either from consuming organic detritus rained down from the surface waters or from eating animals that did. However, in 1977, during an exploratory dive to the Galapagos Rift in the deep-sea exploration submersible Alvin, scientists discovered colonies of assorted creatures clustered around undersea volcanic features known as black smokers. It was soon determined that the basis for this food chain is a form of bacterium that derives its energy from oxidation of reactive chemicals, such as hydrogen or hydrogen sulfide, that bubble up from the Earth's interior. This chemosynthesis revolutionized the study of biology by revealing that terrestrial life need not be Sun-dependent; it only requires water and an energy gradient in order to exist. In order to test some these organisms' potential resilience in outer space, plant seeds and spores of bacteria, fungi and ferns have been exposed to the harsh space environment. Spores are produced as part of the normal life cycle of many plants, algae, fungi and some protozoans, and some bacteria produce endospores or cysts during times of stress. These structures may be highly resilient to ultraviolet and gamma radiation, desiccation, lysozyme, temperature, starvation and chemical disinfectants, while metabolically inactive. Spores germinate when favourable conditions are restored after exposure to conditions fatal to the parent organism. Results from the orbital missions, especially the experiments SEEDS and LiFE, concluded that after an 18-month exposure, some seeds and lichens (Stichococcus sp. and Acarospora sp., a lichenized fungal genus) may be capable to survive interplanetary travel if sheltered inside comets or rocks from cosmic radiation and UV radiation. The LIFE, SPORES, and SEEDS parts of the experiments provided information about the likelihood of lithopanspermia. In 2014, the Rosetta spacecraft arrived at comet 67P/Churyumov–Gerasimenko. A few months after arriving at the comet, Rosetta released a small lander, named Philae, onto its surface. The plan was to investigate Churyumov-Gerasimenko up close for two years. Philae's battery has since died. Scientists hoped that as the comet was travelling toward the sun greater solar energy would recharge Philae (via its solar panels) and Philae would resume operation, but eventually they released information that the chances of contact are close to zero. Rosetta's Project Scientist, Gerhard Schwehm, stated that sterilization is generally not crucial since comets are usually regarded as objects where prebiotic molecules can be found, but not living microorganisms. Notwithstanding, other scientists think it would be an opportunity to gather evidence for one of panspermia's hypotheses: the possibility of both active and dormant microbes inside comets. In 2016 a paper was published reporting that ROSINA mass spectrometer – one of the scientific instruments on-board Rosetta – discovered volatile glycine accompanied by methylamine and ethylamine in the coma of 67P/Churyumov-Gerasimenko. The Tanpopo mission is an orbital astrobiology experiment by Japan that is currently investigating the possible interplanetary transfer of life, organic compounds, and possible terrestrial particles in low Earth orbit. The Tanpopo experiment is taking place at the Exposed Facility located on the exterior of Kibo module of the International Space Station. The mission will collect cosmic dusts and other particles for three years by using an ultra-low density silica gel called aerogel. The purpose is to assess the panspermia hypothesis and the possibility of natural interplanetary transport of life and its precursors. Some of these aerogels will be replaced every one or two years through 2018. Sample collection began in May 2015, and the first samples will be returned to Earth in mid-2016. Wallis and Wickramasinghe argued in 2004 that the transport of individual bacteria or clumps of bacteria, is overwhelmingly more important than lithopanspermia in terms of numbers of microbes transferred, even accounting for the death rate of unprotected bacteria in transit. Then it was found that isolated spores of B. subtilis were killed by several orders of magnitude if exposed to the full space environment for a mere few seconds. These results clearly negate the original panspermia hypothesis, which requires single spores as space travelers accelerated by the radiation pressure of the Sun, requiring many years to travel between the planets. 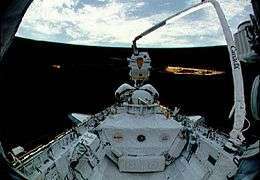 However, if shielded against solar UV, spores of Bacillus subtilis were capable of surviving in space for up to 6 years, especially if embedded in clay or meteorite powder (artificial meteorites). The data support the likelihood of interplanetary transfer of microorganisms within meteorites, the so-called lithopanspermia hypothesis. Fred Hoyle's The Black Cloud is a science fiction novel published in 1957. The story details the arrival of an enormous cloud of gas that enters the Solar System and appears about to destroy most of the life on Earth by blocking the sunlight. The cloud is later revealed as a sentient alien gaseous entity. Jack Finney's novel The Body Snatchers (1955) and the subsequent film adaptations describe spores drifting through space to arrive on the surface of Earth, though the premise is most fully discussed in the second version Invasion of the Body Snatchers (1978 film). Michael Crichton's 1969 novel, The Andromeda Strain, is based on the panspermiatic premise of a meteor bringing an crystalline alien bacterium to Earth. The phrase "Andromeda Strain" has become a shorthand for mysterious infectious diseases. Stephen King's short story "Weeds" (1976), later adapted into the Creepshow vignette "The Lonesome Death of Jordy Verrill" (1982; starring King,) involves a meteor crashing to Earth which carries with it a virulent plant/fungus which spreads rapidly. The opening sequence of Ridley Scott's 2012 Alien prequel, Prometheus depicts a humanoid species, referred to as 'the Engineers', seeding what is presumably the early Earth by disintegrating the body of one of their members and spilling his DNA into the water of the planet. ↑ Wickramasinghe, Chandra (2011). "Bacterial morphologies supporting cometary panspermia: a reappraisal". International Journal of Astrobiology. 10 (1): 25–30. Bibcode:2011IJAsB..10...25W. doi:10.1017/S1473550410000157. ↑ Rampelotto, P. H. (2010). "Panspermia: A promising field of research" (PDF). Astrobiology Science Conference. 1538: 5224. Bibcode:2010LPICo1538.5224R. 1 2 Forward planetary contamination like Tersicoccus phoenicis, that has shown resistance to methods usually used in spacecraft assembly clean rooms: Madhusoodanan, Jyoti (May 19, 2014). "Microbial stowaways to Mars identified". Nature. doi:10.1038/nature.2014.15249. 1 2 Webster, Guy (November 6, 2013). "Rare New Microbe Found in Two Distant Clean Rooms". NASA.gov. Retrieved November 6, 2013. ↑ A variation of the panspermia hypothesis is necropanspermia which is described by astronomer Paul Wesson as follows: "The vast majority of organisms reach a new home in the Milky Way in a technically dead state … Resurrection may, however, be possible." Grossman, Lisa (2010-11-10). "All Life on Earth Could Have Come From Alien Zombies". Wired. Retrieved 10 November 2010. 1 2 Hoyle, F. and Wickramasinghe, N.C. (1981). Evolution from Space. Simon & Schuster Inc., NY, and J.M. Dent and Son, London (1981), ch3 pp. 35–49. 1 2 Klyce, Brig (2001). "Panspermia Asks New Questions". Retrieved 25 July 2013. 1 2 Klyce, Brig (2001). "Panspermia asks new questions". In Kingsley, Stuart A; Bhathal, Ragbir. The Search for Extraterrestrial Intelligence (SETI) in the Optical Spectrum III. Proc. SPIE. The Search for Extraterrestrial Intelligence (SETI) in the Optical Spectrum III. 4273. p. 11. Bibcode:2001SPIE.4273...11K. doi:10.1117/12.435366. 1 2 Dalgarno, A. (2006). "The galactic cosmic ray ionization rate". Proceedings of the National Academy of Sciences. 103 (33): 12269–73. Bibcode:2006PNAS..10312269D. doi:10.1073/pnas.0602117103. PMC 1567869 . PMID 16894166. 1 2 Brown, Laurie M.; Pais, Abraham; Pippard, A. B. (1995). "The physics of the interstellar medium". Twentieth Century Physics (2nd ed.). CRC Press. p. 1765. ISBN 0-7503-0310-7. ↑ Berzelius (1799–1848), J. J. "Analysis of the Alais meteorite and implications about life in other worlds". ↑ Rothschild, Lynn J.; Lister, Adrian M. (June 2003). Evolution on Planet Earth – The Impact of the Physical Environment. Academic Press. pp. 109–127. ISBN 978-0-12-598655-7. ↑ "The word: Panspermia". New Scientist (2541). 7 March 2006. Retrieved 25 July 2013. ↑ "History of Panspermia". Retrieved 25 July 2013. ↑ Arrhenius, S. (1908) Worlds in the Making: The Evolution of the Universe. New York, Harper & Row. ↑ Napier, W.M. (2007). "Pollination of exoplanets by nebulae". Int. J. Astrobiol. 6 (3): 223–228. Bibcode:2007IJAsB...6..223N. doi:10.1017/S1473550407003710. ↑ Wickramasinghe, D. T.; Allen, D. A. (1980). "The 3.4-µm interstellar absorption feature". Nature. 287 (5782): 518–519. Bibcode:1980Natur.287..518W. doi:10.1038/287518a0. ↑ Allen, D. A.; Wickramasinghe, D. T. (1981). "Diffuse interstellar absorption bands between 2.9 and 4.0 µm". Nature. 294 (5838): 239–240. Bibcode:1981Natur.294..239A. doi:10.1038/294239a0. ↑ Wickramasinghe, D. T.; Allen, D. A. (1983). "Three components of 3–4 μm absorption bands". Astrophysics and Space Science. 97 (2): 369–378. Bibcode:1983Ap&SS..97..369W. doi:10.1007/BF00653492. ↑ Fred Hoyle; Chandra Wickramasinghe & John Watson (1986). Viruses from Space and Related Matters. University College Cardiff Press. ↑ Weaver, Rheyanne (April 7, 2009). "Ruminations on other worlds". statepress.com. Retrieved 25 July 2013. ↑ Cockell, Charles S. (19 May 2011). "Exposure of phototrophs to 548 days in low Earth orbit: microbial selection pressures in outer space and on early earth". The ISME Journal. 5 (10): 1671–1682. doi:10.1038/ismej.2011.46. PMC 3176519 . PMID 21593797. ↑ Amos, Jonathan (23 Aug 2010). "Beer microbes live 553 days outside ISS". BBC News. BBC. Retrieved 11 February 2016. ↑ Panitz, Corinna; Horneck, Gerda; Rabbow, Elke; Petra Rettberg, Petra; Moeller, Ralf (January 2015). "The SPORES experiment of the EXPOSE-R mission: Bacillus subtilis spores in artificial meteorites". International Journal of Astrobiology. 14 (Special Issue 1): 105–114. Bibcode:2015IJAsB..14..105P. doi:10.1017/S1473550414000251. ↑ Bell, Elizabeth A.; Boehnike, Patrick; Harrison, T. Mark; et al. (19 October 2015). "Potentially biogenic carbon preserved in a 4.1 billion-year-old zircon". Proc. Natl. Acad. Sci. U.S.A. Washington, D.C.: National Academy of Sciences. 112 (47): 214518–14521. Bibcode:2015PNAS..11214518B. doi:10.1073/pnas.1517557112. PMC 4664351 . PMID 26483481. Early edition, published online before print. ↑ Khan, Amina (7 March 2014). "Did two planets around nearby star collide? Toxic gas holds hints". LA Times. Retrieved 9 March 2014. ↑ Dent, W. R. F.; Wyatt, M. C.; Roberge, A.; Augereau, J.- C.; et al. (6 March 2014). "Molecular Gas Clumps from the Destruction of Icy Bodies in the β Pictoris Debris Disk". Science. 343 (6178): 1490–1492. Bibcode:2014Sci...343.1490D. doi:10.1126/science.1248726. ↑ Wickramasinghe, Chandra; Wickramasinghe, Chandra; Napier, William (2009). Comets and the Origin of Life. World Scientific Press. doi:10.1142/6008. ISBN 978-981-256-635-5. ↑ Wall, Mike. "Comet Impacts May Have Jump-Started Life on Earth". space.com. Retrieved 1 August 2013. ↑ Weber, P; Greenberg, J. M. (1985). "Can spores survive in interstellar space?". Nature. 316 (6027): 403–407. Bibcode:1985Natur.316..403W. doi:10.1038/316403a0. ↑ Melosh, H. J. (1988). "The rocky road to panspermia". Nature. 332 (6166): 687–688. Bibcode:1988Natur.332..687M. doi:10.1038/332687a0. PMID 11536601. 1 2 C. Mileikowsky; F. A. Cucinotta; J. W. Wilson; B. Gladman; et al. (2000). "Risks threatening viable transfer of microbes between bodies in our solar system". Planetary and Space Science. 48 (11): 1107–1115. Bibcode:2000P&SS...48.1107M. doi:10.1016/S0032-0633(00)00085-4. 1 2 3 4 Edward Belbruno; Amaya Moro-Martı´n; Malhotra, Renu & Savransky, Dmitry (2012). "Chaotic Exchange of Solid Material between Planetary". Astrobiology. 12 (8): 754–74. arXiv:1205.1059 . Bibcode:2012AsBio..12..754B. doi:10.1089/ast.2012.0825. PMC 3440031 . PMID 22897115. ↑ Slow-moving rocks better odds that life crashed to Earth from space. News at Princeton, September 24, 2012. 1 2 Crick, F. H.; Orgel, L. E. (1973). "Directed Panspermia". Icarus. 19 (3): 341–348. Bibcode:1979JBIS...32..419M. doi:10.1016/0019-1035(73)90110-3. ↑ Mautner, M; Matloff, G. (1979). "Directed panspermia: A technical evaluation of seeding nearby planetary systems" (PDF). Journal of the British Interplanetary Society. 32: 419. 1 2 3 Mautner, M. N. (1997). "Directed panspermia. 3. Strategies and motivation for seeding star-forming clouds" (PDF). Journal of the British Interplanetary Society. 50: 93–102. Bibcode:1997JBIS...50...93M. 1 2 "Impacts 'more likely' to have spread life from Earth". BBC. 23 August 2011. Retrieved 24 August 2011. ↑ "Electromagnetic space travel for bugs? – space – 21 July 2006 – New Scientist Space". Space.newscientist.com. Archived from the original on January 11, 2009. Retrieved December 8, 2014. ↑ Dehel, T. (2006-07-23). "Uplift and Outflow of Bacterial Spores via Electric Field". 36th COSPAR Scientific Assembly. Held 16–23 July 2006. Adsabs.harvard.edu. 36: 1. arXiv:hep-ph/0612311 . Bibcode:2006cosp...36....1D. ↑ "Die Verbreitung des Lebens im Weltenraum" (the "Distribution of Life in Space"). Published in Die Umschau. 1903. ↑ Nicholson, Wayne L. (2009). "Ancient micronauts: interplanetary transport of microbes by cosmic impacts". Trends in Microbiology. 17 (6): 243–250. doi:10.1016/j.tim.2009.03.004. PMID 19464895. 1 2 3 4 5 6 7 Horneck, G.; Klaus, D. M.; Mancinelli, R. L. (2010). "Space Microbiology". Microbiology and Molecular Biology Reviews. 74 (1): 121–56. doi:10.1128/MMBR.00016-09. PMC 2832349 . PMID 20197502. ↑ Wickramasinghe, M.K. ; Wickramasinghe, C. (2004). "Interstellar transfer of planetary microbiota". Mon. Not. R. Astron. Soc. 348: 52–57. Bibcode:2004MNRAS.348...52W. doi:10.1111/j.1365-2966.2004.07355.x. 1 2 Horneck, G; Rettberg, P; Reitz, G; Wehner, J; Eschweiler, U; Strauch, K; Panitz, C; Starke, V; Baumstark-Khan, C (2001). 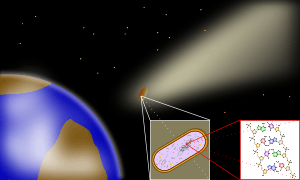 "Protection of Bacterial Spores in Space, a Contribution to the Discussion on Panspermia". Origins of life and evolution of the biosphere : the journal of the International Society for the Study of the Origin of Life. 31 (6): 527–47. Bibcode:2002ESASP.518..105R. PMID 11770260. ↑ Rahn, R.O. ; Hosszu, J.L. (1969). "Influence of relative humidity on the photochemistry of DNA films". Biochim. Biophys. Acta. 190 (1): 126–131. doi:10.1016/0005-2787(69)90161-0. PMID 4898489. ↑ Patrick, M.H. ; Gray, D.M. (1976). "Independence of photproduct formation on DNA conformation". Photochem. Photobiol. 24 (6): 507–513. doi:10.1111/j.1751-1097.1976.tb06867.x. PMID 1019243. 1 2 Wayne L. Nicholson; Andrew C. Schuerger; Peter Setlow (21 January 2005). "The solar UV environment and bacterial spore UV resistance: considerations for Earth-to-Mars transport by natural processes and human spaceflight" (PDF). Mutation Research. 571 (1–2): 249–264. doi:10.1016/j.mrfmmm.2004.10.012. PMID 15748651. Retrieved 2 August 2013. 1 2 Clark, Benton C. Clark (February 2001). "Planetary Interchange of Bioactive Material: Probability Factors and Implications". Origins of life and evolution of the biosphere. 31 (1–2): 185–197. Bibcode:2001OLEB...31..185C. doi:10.1023/A:1006757011007. PMID 11296521. ↑ Mileikowsky, C; Cucinotta, F. A.; Wilson, J. W.; Gladman, B; Horneck, G; Lindegren, L; Melosh, J; Rickman, H; Valtonen, M; Zheng, J. Q. (2000). "Natural Transfer of Microbes in space, part I: from Mars to Earth and Earth to Mars". Icarus. 145 (2): 391–427. PMID 11543506. 1 2 3 4 5 6 7 Olsson-Francis, Karen; Cockell, Charles S. (2010). "Experimental methods for studying microbial survival in extraterrestrial environments". Journal of Microbiological Methods. 80 (1): 1–13. doi:10.1016/j.mimet.2009.10.004. PMID 19854226. 1 2 Cockell, Charles S. (2007). "The Interplanetary Exchange of Photosynthesis". Origins of Life and Evolution of Biospheres. 38: 87–104. Bibcode:2008OLEB...38...87C. doi:10.1007/s11084-007-9112-3. ↑ Horneck, Gerda; Stöffler, Dieter; Ott, Sieglinde; Hornemann, Ulrich; et al. (2008). "Microbial Rock Inhabitants Survive Hypervelocity Impacts on Mars-Like Host Planets: First Phase of Lithopanspermia Experimentally Tested". Astrobiology. 8 (1): 17–44. Bibcode:2008AsBio...8...17H. doi:10.1089/ast.2007.0134. PMID 18237257. ↑ Fajardo-Cavazos, Patricia; Link, Lindsey; Melosh, H. Jay; Nicholson, Wayne L. (2005). "Bacillus subtilis Spores on Artificial Meteorites Survive Hypervelocity Atmospheric Entry: Implications for Lithopanspermia". Astrobiology. 5 (6): 726–36. Bibcode:2005AsBio...5..726F. doi:10.1089/ast.2005.5.726. PMID 16379527. ↑ Brack, A.; Baglioni, P.; Borruat, G.; Brandstätter, F.; et al. (2002). "Do meteoroids of sedimentary origin survive terrestrial atmospheric entry? The ESA artificial meteorite experiment STONE". Planetary and Space Science. 50 (7–8): 763–772. Bibcode:2002P&SS...50..763B. doi:10.1016/S0032-0633(02)00018-1. ↑ Cockell, Charles S.; Brack, André; Wynn-Williams, David D.; Baglioni, Pietro; et al. (2007). "Interplanetary Transfer of Photosynthesis: An Experimental Demonstration of a Selective Dispersal Filter in Planetary Island Biogeography". Astrobiology. 7 (1): 1–9. Bibcode:2007AsBio...7....1C. doi:10.1089/ast.2006.0038. PMID 17407400. ↑ "Could Life Have Survived a Fall to Earth?". EPSC. 12 September 2013. Retrieved 2015-04-21. ↑ Gold, T. "Cosmic Garbage", Air Force and Space Digest, 65 (May 1960). ↑ "Anticipating an RNA world. Some past speculations on the origin of life: where are they today?" by L. E. Orgel and F. H. C. Crick in FASEB J. (1993) Volume 7 pages 238–239. ↑ Mautner, Michael N. (2009). "Life-centered ethics, and the human future in space" (PDF). Bioethics. 23 (8): 433–440. doi:10.1111/j.1467-8519.2008.00688.x. PMID 19077128. ↑ Mautner, Michael Noah Ph.D. (2000). Seeding the Universe with Life: Securing our Cosmological Future (PDF). Legacy Books (www.amazon.com). ISBN 0-476-00330-X. 1 2 Mautner, Michael N. (2002). "Planetary bioresources and astroecology. 1. Planetary microcosm bioessays of Martian and meteorite materials: soluble electrolytes, nutrients, and algal and plant responses" (PDF). Icarus. 158: 72–86. Bibcode:2002Icar..158...72M. doi:10.1006/icar.2002.6841. ↑ Marx, G. (1979). "Message through time". Acta Astronautica. 6 (1–2): 221–225. Bibcode:1979AcAau...6..221M. doi:10.1016/0094-5765(79)90158-9. ↑ Yokoo, H.; Oshima, T. (1979). "Is bacteriophage φX174 DNA a message from an extraterrestrial intelligence?". Icarus. 38 (1): 148–153. Bibcode:1979Icar...38..148Y. doi:10.1016/0019-1035(79)90094-0. ↑ Overbye, Dennis (26 June 2007). "Human DNA, the Ultimate Spot for Secret Messages (Are Some There Now?)". Retrieved 2014-10-09. ↑ Davies, Paul C.W. (2010). The Eerie Silence: Renewing Our Search for Alien Intelligence. Boston, Massachusetts: Houghton Mifflin Harcourt. ISBN 978-0-547-13324-9. ↑ Shcherbak, Vladimir I.; Makukov, Maxim A. (2013). "The "Wow! signal" of the terrestrial genetic code". Icarus. 224 (1): 228–242. Bibcode:2013Icar..224..228S. doi:10.1016/j.icarus.2013.02.017. ↑ Makukov, Maxim (4 October 2014). "Claim to have identified extraterrestrial signal in the universal genetic code thereby confirming directed panspermia". The New Reddit Journal of Science. Retrieved 2014-10-09. ↑ Makukov, Maxim A.; Shcherbak, Vladimir I. (2014). "Space ethics to test directed panspermia". Life Sciences in Space Research. 3: 10–17. Bibcode:2014LSSR....3...10M. doi:10.1016/j.lssr.2014.07.003. ↑ "'Seed of Life' From Outer Space Suggests Aliens Created Life On Earth, U.K. Scientists Say". The Inquisitr. February 13, 2015. Retrieved 2015-03-11. ↑ Wickramasinghe, N.C. (1974). "Formaldehyde Polymers in Interstellar Space". Nature. 252 (5483): 462–463. Bibcode:1974Natur.252..462W. doi:10.1038/252462a0. ↑ Martins, Zita; Botta, Oliver; Fogel, Marilyn L.; Sephton, Mark A.; Glavin, Daniel P.; Watson, Jonathan S.; Dworkin, Jason P.; Schwartz, Alan W.; Ehrenfreund, Pascale (2008). "Extraterrestrial nucleobases in the Murchison meteorite". Earth and Planetary Science Letters. 270: 130–136. Bibcode:2008E&PSL.270..130M. doi:10.1016/j.epsl.2008.03.026. ↑ "We may all be space aliens: study". AFP. 20 August 2009. Archived from the original on June 17, 2008. Retrieved 8 November 2014. ↑ "'Life chemical' detected in comet". NASA. BBC News. 18 August 2009. Retrieved 6 March 2010. ↑ Callahan, M. P.; Smith, K. E.; Cleaves, H. J.; Ruzicka, J.; et al. (2011). 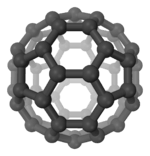 "Carbonaceous meteorites contain a wide range of extraterrestrial nucleobases". Proceedings of the National Academy of Sciences. 108 (34): 13995–8. Bibcode:2011PNAS..10813995C. doi:10.1073/pnas.1106493108. PMC 3161613 . PMID 21836052. ↑ Steigerwald, John (8 August 2011). "NASA Researchers: DNA Building Blocks Can Be Made in Space". NASA. Retrieved 10 August 2011. 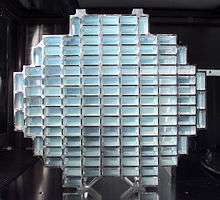 ↑ "DNA Building Blocks Can Be Made in Space, NASA Evidence Suggests". ScienceDaily. 9 August 2011. Retrieved 9 August 2011. ↑ "Astronomers Discover Complex Organic Matter Exists Throughout the Universe". ScienceDaily. 26 October 2011. Retrieved 27 October 2011. ↑ Kwok, Sun; Zhang, Yong (2011). "Mixed aromatic–aliphatic organic nanoparticles as carriers of unidentified infrared emission features". Nature. 479 (7371): 80–3. Bibcode:2011Natur.479...80K. doi:10.1038/nature10542. PMID 22031328. ↑ "Sweet! Astronomers spot sugar molecule near star". AP News. August 29, 2012. Retrieved August 31, 2012. ↑ Jørgensen, Jes K.; Favre, Cécile; Bisschop, Suzanne E.; Bourke, Tyler L.; et al. (2012). "Detection of the Simplest Sugar, Glycolaldehyde, in a Solar-Type Protostar with Alma". The Astrophysical Journal. 757: L4. Bibcode:2012ApJ...757L...4J. doi:10.1088/2041-8205/757/1/L4. 1 2 "NASA Cooks Up Icy Organics to Mimic Life's Origins". Space.com. September 20, 2012. Retrieved September 22, 2012. 1 2 Gudipati, Murthy S.; Yang, Rui (2012). "In-Situ Probing of Radiation-Induced Processing of Organics in Astrophysical Ice Analogs—Novel Laser Desorption Laser Ionization Time-Of-Flight Mass Spectroscopic Studies". The Astrophysical Journal. 756: L24. Bibcode:2012ApJ...756L..24G. doi:10.1088/2041-8205/756/1/L24. ↑ Loomis, Ryan A.; Zaleski, Daniel P.; Steber, Amanda L.; Neill, Justin L.; et al. (2013). "The Detection of Interstellar Ethanimine (Ch3Chnh) from Observations Taken During the Gbt Primos Survey". The Astrophysical Journal. 765: L9. Bibcode:2013ApJ...765L...9L. doi:10.1088/2041-8205/765/1/L9. ↑ Kaiser, R. I.; Stockton, A. M.; Kim, Y. S.; Jensen, E. C.; et al. (March 5, 2013). "On the Formation of Dipeptides in Interstellar Model Ices". The Astrophysical Journal. 765 (2): 111. Bibcode:2013ApJ...765..111K. doi:10.1088/0004-637X/765/2/111. Lay summary – Phys.org. ↑ Hoover, Rachel (February 21, 2014). "Need to Track Organic Nano-Particles Across the Universe? NASA's Got an App for That". NASA. Retrieved 22 February 2014. ↑ Loeb, Abraham (October 2014). "The Habitable Epoch of the Early Universe". International Journal of Astrobiology. 13 (4): 337–39. Bibcode:2014IJAsB..13..337L. doi:10.1017/S1473550414000196. ↑ Loeb, Abraham (2 December 2013). "The Habitable Epoch of the Early Universe". International Journal of Astrobiology. 13 (4): 337–339. arXiv:1312.0613v3 . Bibcode:2014IJAsB..13..337L. doi:10.1017/S1473550414000196. ↑ Rampelotto, P.H. (2010). "Panspermia: A Promising Field Of Research" (PDF). Astrobiology Science Conference. Harvard: USRA. Bibcode:2010LPICo1538.5224R. Retrieved 3 December 2014. ↑ Graham, Robert W (February 1990). "Extraterrestrial Life in the Universe" (PDF). Technical Memorandum. Lewis Research Center, OH: NASA. 102363. Retrieved 7 July 2014. ↑ Altermann, Wladyslaw (2008). "From Fossils to Astrobiology – A Roadmap to Fata Morgana?". In Seckbach, Joseph; Walsh, Maud. From Fossils to Astrobiology: Records of Life on Earth and the Search for Extraterrestrial Biosignatures. 12. p. xvii. ISBN 1-4020-8836-1. ↑ Webb, Stephen (2002), If the universe is teeming with aliens, where is everybody? Fifty solutions to the Fermi paradox and the problem of extraterrestrial life, Copernicus, Springer, OCLC 50164852 . ↑ Steffen, Jason H.; Batalha, Natalie M.; Borucki, William J; Buchhave, Lars A.; et al. (9 November 2010). "Five Kepler target stars that show multiple transiting exoplanet candidates". Astrophysical Journal. 725: 1226–41. arXiv:1006.2763 . Bibcode:2010ApJ...725.1226S. doi:10.1088/0004-637X/725/1/1226. 1 2 Overbye, Dennis (November 4, 2013). "Far-Off Planets Like the Earth Dot the Galaxy". The New York Times. Retrieved 5 November 2013. 1 2 Petigura, Eric A.; Howard, Andrew W.; Marcy, Geoffrey W (October 31, 2013). "Prevalence of Earth-size planets orbiting Sun-like stars". Proceedings of the National Academy of Sciences of the United States of America. 110 (48): 19273–78. Bibcode:2013PNAS..11019273P. doi:10.1073/pnas.1319909110. ↑ Khan, Amina (November 4, 2013). "Milky Way may host billions of Earth-size planets". The Los Angeles Times. Retrieved 5 November 2013. ↑ Crawford, I.A. (Sep 1995). "Some Thoughts on the Implications of Faster-Than-Light Interstellar Space Travel". Quarterly Journal of the Royal Astronomical Society. 36 (3): 205. Bibcode:1995QJRAS..36..205C. 1 2 Byrne, Joseph Patrick (2008). "Panspermia". Encyclopedia of Pestilence, Pandemics, and Plagues (entry). ABC-CLIO. pp. 454–55. ISBN 978-0-313-34102-1. ↑ Wickramasinghe, C; Wainwright, M; Narlikar, J (May 24, 2003). "SARS—a clue to its origins?". Lancet. 361 (9371): 1832. doi:10.1016/S0140-6736(03)13440-X. PMID 12781581. ↑ Willerslev, E; Hansen, AJ; Rønn, R; Nielsen, OJ (Aug 2, 2003). "Panspermia – true or false?". Lancet. 362 (9381): 406; author reply 407–8. doi:10.1016/S0140-6736(03)14039-1. PMID 12907025. ↑ Bhargava, PM (Aug 2, 2003). "Panspermia – true or false?". Lancet. 362 (9381): 407; author reply 407–8. doi:10.1016/S0140-6736(03)14041-X. PMID 12907028. ↑ Ponce de Leon, S; Lazcano, A (Aug 2, 2003). "Panspermia – true or false?". Lancet. 362 (9381): 406–7; author reply 407–8. doi:10.1016/s0140-6736(03)14040-8. PMID 12907026. ↑ Qu, Jiangwen (2016). "Is sunspot activity a factor in influenza pandemics?". Reviews in Medical Virology. 26 (5): 309–13. doi:10.1002/rmv.1887. PMID 27136236. ↑ "New Study Adds to Finding of Ancient Life Signs in Mars Meteorite". NASA. 2009-11-30. Retrieved 1 December 2009. ↑ Thomas-Keprta, K.; Clemett, S; McKay, D; Gibson, E & Wentworth, S (2009). "Origin of Magnetite Nanocrystals in Martian Meteorite ALH84001". Geochimica et Cosmochimica Acta. 73 (21): 6631–6677. Bibcode:2009GeCoA..73.6631T. doi:10.1016/j.gca.2009.05.064. ↑ "Alien visitors". New Scientist Space. 11 May 2001. Retrieved 20 August 2009. ↑ D’Argenio, Bruno; Geraci, Giuseppe & del Gaudio, Rosanna (March 2001). "Microbes in rocks and meteorites: a new form of life unaffected by time, temperature, pressure". Rendiconti Lincei. 12 (1): 51–68. doi:10.1007/BF02904521. ↑ Geraci, Giuseppe; del Gaudio, Rosanna; D’Argenio, Bruno (2001). "Microbes in rocks and meteorites: a new form of life unaffected by time, temperature, pressure" (PDF). Rend. Fis. Acc. Linceis. 9: 51–68. ↑ "Scientists Say They Have Found Extraterrestrial Life in the Stratosphere But Peers Are Skeptical". Scientific American. 2001-07-31. Retrieved 20 August 2009. ↑ Narlikar, JV; Lloyd, D; Wickramasinghe, NC; Turner; Al-Mufti; Wallis; Wainwright; Rajaratnam; Shivaji; Reddy; Ramadurai; Hoyle (2003). "Balloon experiment to detect micro-organisms in the outer space". Astrophys Space Sci. 285 (2): 555–62. Bibcode:2003Ap&SS.285..555N. doi:10.1023/A:1025442021619. ↑ Wainwright, M; Wickramasinghe, N.C; Narlikar, J.V; Rajaratnam, P. "Microorganisms cultured from stratospheric air samples obtained at 41 km". Retrieved 11 May 2007. ↑ Wainwright, M (2003). "A microbiologist looks at panspermia". Astrophys Space Sci. 285 (2): 563–70. Bibcode:2003Ap&SS.285..563W. doi:10.1023/A:1025494005689. ↑ Vaidya, Pushkar Ganesh (July 2009). "Critique on Vindication of Panspermia" (PDF). Apeiron. 16 (3). Retrieved 28 November 2009. ↑ Mumbai scientist challenges theory that bacteria came from space, India: AOL . ↑ Timothy Oleson (May 5, 2013). "Lofted by hurricanes, bacteria live the high life". NASA. Earth Magazine. Retrieved 21 September 2013. ↑ Helen Shen (28 January 2013). "High-flying bacteria spark interest in possible climate effects". Nature News. doi:10.1038/nature.2013.12310. ↑ Wickramasinghe, N. C.; Wallis, J.; Wallis, D. H.; Samaranayake, Anil (January 10, 2013). "Fossil Diatoms in a New Carbonaceous Meteorite" (PDF). Journal of Cosmology. 21 (37): 1–14. arXiv:1303.2398 . Bibcode:2013JCos...21.9560W. Retrieved January 14, 2013. ↑ Phil Plait (15 January 2013). "No, Diatoms Have Not Been Found in a Meteorite". Slate.com – Astronomy. Retrieved 16 January 2013. 1 2 3 4 5 Wallis, Jamie; Miyake, Nori; Hoover, Richard B.; Oldroyd, Andrew; et al. (5 March 2013). "The Polonnaruwa meteorite: oxygen isotope, crystalline and biological composition" (PDF). Journal of Cosmology. 22 (2): 1845. arXiv:1303.1845 . Bibcode:2013JCos...2210004W. Retrieved 7 March 2013. 1 2 3 Wickramasinghe, N.C.; J. Wallis; N. Miyake; Anthony Oldroyd; et al. (4 February 2013). "Authenticity of the life-bearing Polonnaruwa meteorite" (PDF). Journal of Cosmology. Retrieved 4 February 2013. ↑ Griffin, Dale Warren (14 August 2013). "The Quest for Extraterrestrial Life: What About the Viruses?". Astrobiology. 13 (8): 774–783. Bibcode:2013AsBio..13..774G. doi:10.1089/ast.2012.0959. ↑ Anders, E.; Dufresne, E. R.; Hayatsu, R.; Cavaille, A.; Dufresne, A.; Fitch, F. W. (1964). "Contaminated Meteorite". Science. 146 (3648): 1157. doi:10.1126/science.146.3648.1157. PMID 17832241. ↑ Choi, Charles Q. (17 March 2013). 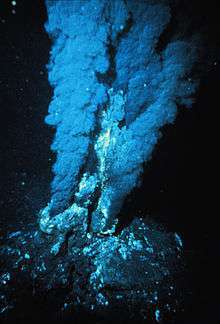 "Microbes Thrive in Deepest Spot on Earth". LiveScience. Retrieved 17 March 2013. ↑ Glud, Ronnie; Wenzhöfer, Frank; Middelboe, Mathias; Oguri, Kazumasa; et al. (17 March 2013). "High rates of microbial carbon turnover in sediments in the deepest oceanic trench on Earth". Nature Geoscience. 6 (4): 284–288. Bibcode:2013NatGe...6..284G. doi:10.1038/ngeo1773. ↑ Cavicchioli, R. (Fall 2002). "Extremophiles and the search for extraterrestrial life". Astrobiology. 2 (3): 281–92. Bibcode:2002AsBio...2..281C. doi:10.1089/153110702762027862. PMID 12530238. 1 2 Surviving the Final Frontier. 25 November 2002. ↑ Christner, Brent C. (2002). "Detection, recovery, isolation, and characterization of bacteria in glacial ice and Lake Vostok accretion ice". Ohio State University. Retrieved 4 February 2011. ↑ Nanjundiah, V. (2000). "The smallest form of life yet?" (PDF). Journal of Biosciences. 25 (1): 9–10. doi:10.1007/BF02985175. PMID 10824192. 1 2 3 Rabbow, Elke Rabbow; Gerda Horneck; Petra Rettberg; Jobst-Ulrich Schott; et al. (9 July 2009). "EXPOSE, an Astrobiological Exposure Facility on the International Space Station – from Proposal to Flight" (PDF). Orig Life Evol Biosph. 39 (6): 581–98. doi:10.1007/s11084-009-9173-6. PMID 19629743. Retrieved 8 July 2013. ↑ Tepfer, David Tepfer (December 2008). "The origin of life, panspermia and a proposal to seed the Universe". Plant Science. 175 (6): 756–760. doi:10.1016/j.plantsci.2008.08.007. ↑ "Exobiology and Radiation Assembly (ERA)". ESA. NASA. 1992. Retrieved 22 July 2013. 1 2 Zhang (1995). "ERA-experiment "space biochemistry"". Advances in Space Research. 16 (8): 119–129. doi:10.1016/0273-1177(95)00280-R. PMID 11542696. ↑ Vaisberg, Horneck G; Eschweiler U; Reitz G; Wehner J; et al. (1995). "Biological responses to space: results of the experiment "Exobiological Unit" of ERA on EURECA I". Adv. Space Res. 16 (8): 105–18. Bibcode:1995AdSpR..16..105V. doi:10.1016/0273-1177(95)00279-N. PMID 11542695. ↑ "BIOPAN Pan for exposure to space environment". Kayser Italia. 2013. Retrieved 17 July 2013. ↑ De La Torre Noetzel, Rosa (2008). "Experiment lithopanspermia: Test of interplanetary transfer and re-entry process of epi- and endolithic microbial communities in the FOTON-M3 Mission". 37th COSPAR Scientific Assembly. Held 13–20 July 2008. 37: 660. Bibcode:2008cosp...37..660D. ↑ "Life in Space for Life ion Earth – Biosatelite Foton M3". June 26, 2008. Retrieved 13 October 2009. ↑ Jönsson, K. Ingemar Jönsson; Elke Rabbow; Ralph O. Schill; Mats Harms-Ringdahl; et al. (9 September 2008). "Tardigrades survive exposure to space in low Earth orbit". Current Biology. 18 (17): R729–R731. doi:10.1016/j.cub.2008.06.048. PMID 18786368. ↑ de Vera; J.P.P. ; et al. (2010). "COSPAR 2010 Conference". Research Gate. Retrieved 17 July 2013. ↑ Paul Clancy (Jun 23, 2005). Looking for Life, Searching the Solar System. Cambridge University Press. ISBN 9780521824507. Retrieved 26 March 2014. ↑ Tepfer, David Tepfer; Andreja Zalar & Sydney Leach. (May 2012). "Survival of Plant Seeds, Their UV Screens, and nptII DNA for 18 Months Outside the International Space Station". Astrobiology. 12 (5): 517–528. Bibcode:2012AsBio..12..517T. doi:10.1089/ast.2011.0744. PMID 22680697. ↑ Scalzi, Giuliano Scalzi; Laura Selbmann; Laura Zucconi; Elke Rabbow; et al. (1 June 2012). "LIFE Experiment: Isolation of Cryptoendolithic Organisms from Antarctic Colonized Sandstone Exposed to Space and Simulated Mars Conditions on the International Space Station". Origins of Life and Evolution of Biospheres. 42 (2–3): 253–262. doi:10.1007/s11084-012-9282-5. ↑ Onofri, Silvano Onofri; Rosa de la Torre; Jean-Pierre de Vera; Sieglinde Ott; et al. (May 2012). "Survival of Rock-Colonizing Organisms After 1.5 Years in Outer Space". Astrobiology. 12 (5): 508–516. Bibcode:2012AsBio..12..508O. doi:10.1089/ast.2011.0736. PMID 22680696. ↑ Neuberger, Katja; Lux-Endrich, Astrid; Panitz, Corinna; Horneck, Gerda (January 2015). "Survival of Spores of Trichoderma longibrachiatum in Space: data from the Space Experiment SPORES on EXPOSE-R". International Journal of Astrobiology. 14 (Special Issue 1): 129–135. Bibcode:2015IJAsB..14..129N. doi:10.1017/S1473550414000408. ↑ Schulze-Makuch, Dirk (3 September 2014). 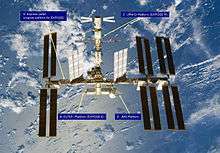 "New ISS Experiment Tests Organisms' Survival Skills in Space". Air and Space Magazine. Retrieved 2014-09-04. ↑ esa. "Rosetta's lander faces eternal hibernation". European Space Agency. Retrieved 2016-06-08. ↑ "Nol bugs please, this is a clean planet!". European Space Agency (ESA). 30 July 2002. Retrieved 16 July 2013. ↑ Bibring, J.-P.; Taylor, M.G.G.T. ; Alexander, C.; Auster, U.; Biele, J.; Finzi, A. Ercoli; Goesmann, F.; Klingehoefer, G.; Kofman, W.; Mottola, S.; Seidenstiker, K.J. ; Spohn, T.; Wright, I. (31 July 2015). "Philae's First Days on the Comet – Introduction to Special Issue". Science. 349 (6247): 493. Bibcode:2015Sci...349..493B. doi:10.1126/science.aac5116. ↑ Altwegg, Kathrin; Balsiger, Hans; Bar-Nun, Akiva; Berthelier, Jean-Jacques; Bieler, Andre; Bochsler, Peter; Briois, Christelle; Calmonte, Ursina; Combi, Michael R. (2016-05-01). "Prebiotic chemicals—amino acid and phosphorus—in the coma of comet 67P/Churyumov-Gerasimenko". Science Advances. 2 (5): e1600285. doi:10.1126/sciadv.1600285. PMC 4928965 . PMID 27386550. ↑ Yokobori, Shin-ichi et al (2010) Microbe space exposure experiment at International Space Station (ISS) proposed in "Tanpopo" mission. Research Gate. ↑ Yano, H. et al. (2014) "Tanpopo Experiment for Wastrobiology Exposure and Micrometeoroid Capture Onboard the ISS-JEM Exposed Facility." 45th Lunar and Planetary Science Conference. ↑ Tanpopo mission to search space for origins of life. The Japan News, April 16, 2015. ↑ Yuko, Kawaguchi (13 May 2016). "Investigation of the Interplanetary Transfer of Microbes in the Tanpopo Mission at the Exposed Facility of the International Space Station". Astrobiology. 16 (5): 363–376. Bibcode:2016AsBio..16..363K. doi:10.1089/ast.2015.1415. PMID 27176813. Crick, F (1981), Life, Its Origin and Nature, Simon & Schuster, ISBN 0-7088-2235-5 . Hoyle, F (1983), The Intelligent Universe, London: Michael Joseph, ISBN 0-7181-2298-4 . "Earth sows its seeds in space". Nature News. 23 February 2004. doi:10.1038/news040216-20 (inactive 2016-10-30). Warmflash, D.; Weiss, B. (24 October 2005). "Did Life Come from Another World?". Scientific American. 293 (5): 64–71. doi:10.1038/scientificamerican1105-64.